I spend a lot of time (still) trying to ready my shop to open. 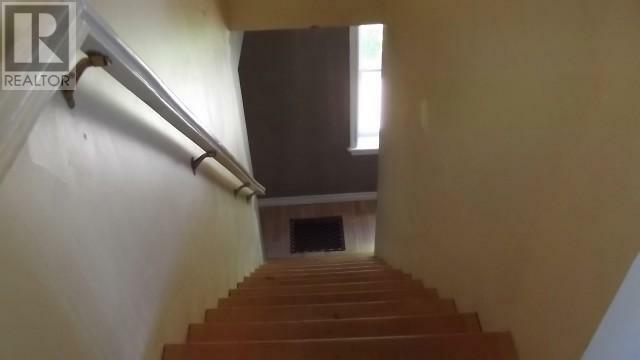 Including days just stripping a hand rail that was painted white. It leads upstairs to where I have three bedrooms that are currently being used for storage and need a good painting. I’ve painted the sides of the stairway walls and some of the upstairs hallway. They were all in poor condition, yellowed from smoke, and needed a good covering primer before I painted them. Because of this time consuming and uncreative work, I need to stop every now and then and make something to sell in the shop. If you are creative, you will know what I mean! Because my store will be in an area that gets tourists from late May until late September, (and that’s being optimistic) I need to have some tourist type products that relate to the beautiful island I live on. So, I’ve been working on mermaids, lobsters, anchors, boats, lighthouse, cottage and beach themed items. I’ll just show one today, because although I have photos, I really haven’t much time these days for blogging, so they aren’t organized yet. I got this idea from seeing something similar but larger, on a couple blogs and thought I’d try it. I really like this! Beach, sea, sky! I totally hear you about wanting to add some other detail (though I like it the way it is). Maybe some text – either the PEI or is there some quote about the place you could transfer on there? Just a thought. A fish jumping out of the water? I love it just as it is…. but I think change is good too. Keep us posted. What about a little dingy made of scrap lath wood? Nice colour tones. Side note: I typed in "color" and it told me I spelled it wrong. Those silly Americans.